“Eat Your Veggies” is a pseudo-weekly series featuring seasonal, delicious vegetable recipes. Winter is upon us, which means I have to cheat a little with the “seasonal” aspect of eat your veggies. In the Pacific Northwest, very little grows over winter. Our farmers markets close up, the CSAs either stop or switch to imported produce, and the little “Washington Grown” tags are scarce in the produce department. Our choices are to either spend the winter subsisting on local potatoes and apples, or switch to imported foods. Onions and garlic last all winter! 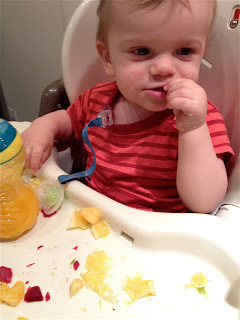 Eat things you’d buy imported anyway, like tropical fruits. Citrus and avocado are actually better in winter, and in the PNW, they’re always imported anyway. What’s on sale at the supermarket? If its on sale, it is likely in season somewhere relatively nearby. In the PNW, “relatively nearby” means California. Things that are still relatively in season: cabbage, kale, root vegetables. Buy frozen produce. It’s usually packaged in season, when there’s a surplus. Freeze or can your own local produce during the spring, summer and fall. Most things can be frozen with the right preparation. This is the most desirable solution, but requires forethought. I’ll try to focus on recipes that highlight some of these strategies in the future. For this week, I bought some spinach that was on sale. It had a code on the package that allowed me to use HarvestMark.com to see that it was grown in either Southern California or Arizona, and was harvested about 7 days prior to when I purchased it. Not too shabby, for winter! I ate this with hot sauce and an egg fried in a tortilla. 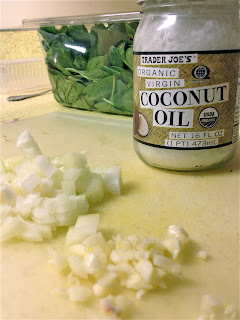 Melt coconut oil over medium heat in a saute pan. Add onion and spices and saute for 3-5 minutes, or until onion is soft. Add garlic, saute 1 minute more. Add spinach to pan. 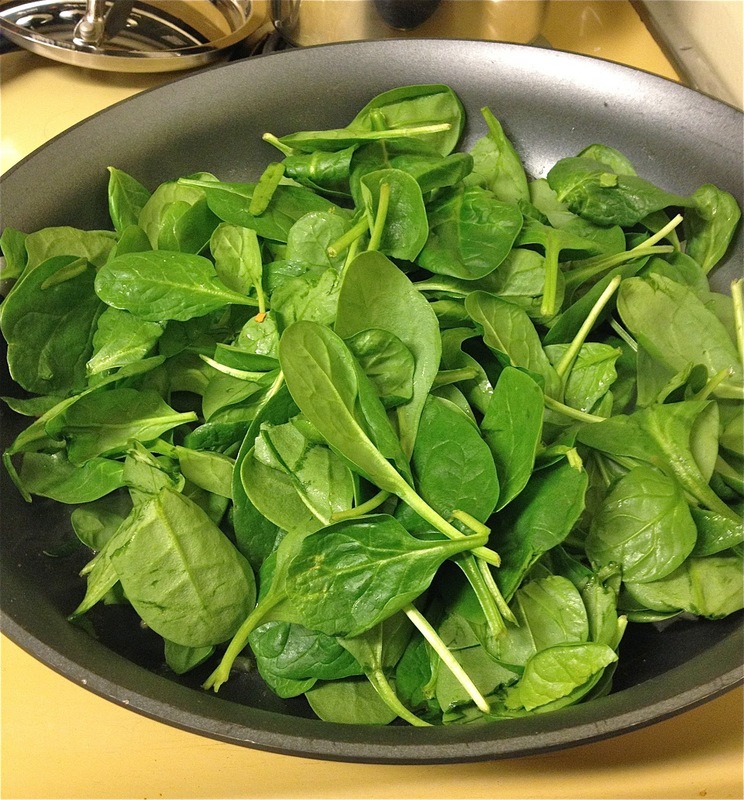 Stir and cook for about 30 seconds, then cover the pan, remove from heat, and allow spinach to steam for about 3-4 minutes or until wilted. The tradition of drinking sweet hot alcoholic beverages in winter is very old. Colonists in what would become the US started drinking them with the alcohol popular in the new world: rum. Most traditional recipes for Hot Buttered Rum involve hot water, rum, and spices, with a pat of butter floated on top. Imagine its the dead of a winter, in pre-revolutionary times, before the electric light. Its cold and dark, and you’re probably sick with any number of awful diseases. 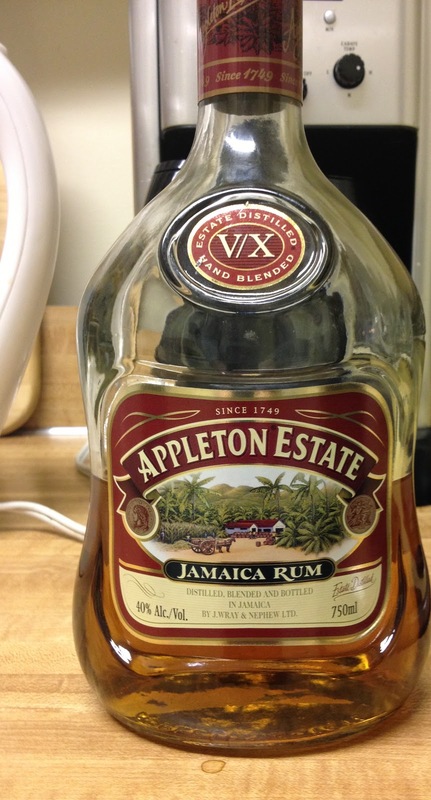 Watered down rum is probably the closest thing you’re going to get to cough syrup, so I get that. Spices? Delicious and festive. But I don’t really understand why someone decided to add a pat of butter to all of that. Apparently it was a common practice, as people also added it to beer. At some point in the 20th century, someone decided to add ice cream. And why not? Ice cream makes everything great. For my recipe, I used less sugar than many recipes and froze the batter in a silicon muffin tin for pre-portioned servings. If you don’t drink alcohol, try just adding boiling water (I drank watered down batter every year as a kid and kind of prefer it now). Alternately, I’m told that it is a delicious addition to coffee. Combine ingredients in medium bowl with a hand mixer. The butter will harden up upon contact with the cold ice cream, and that's alright. 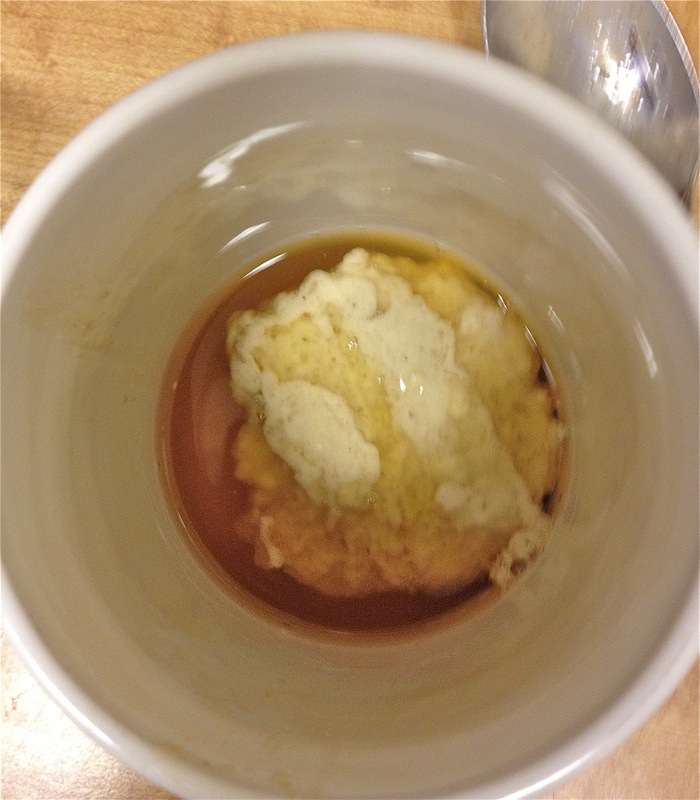 As long as the lumps are small and emulsified in the mixture, everything will be fine. 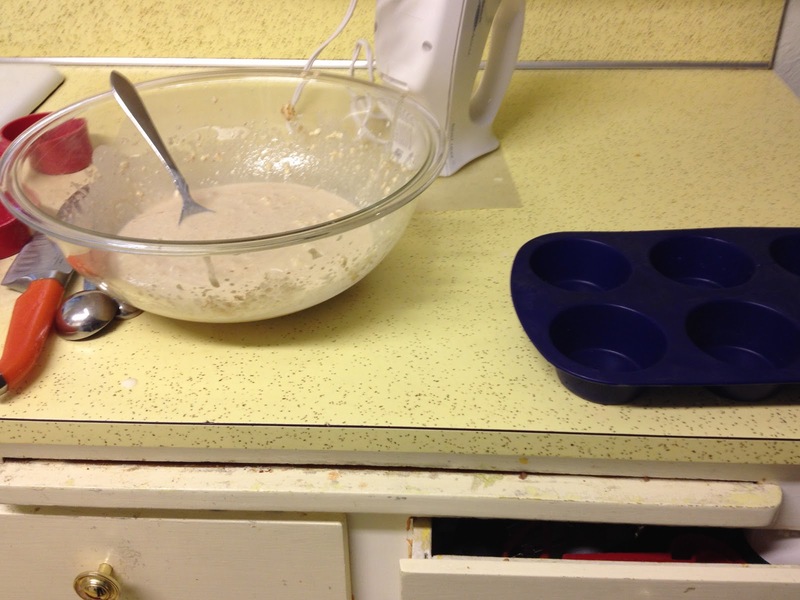 Portion 1/4 cup servings into a silicon muffin tin. Freeze at least 6 hours or overnight. 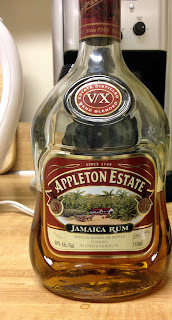 To serve: Combine with desired amount of dark rum (completely depends on how much you like rum, but start with about 1 oz) and 8 oz boiling water. Stir until melted. OR, combine with hot strong coffee and stir until melted. the hot water seems to enhance the flavor. Recipe Source: Loosely based on this recipe, from Allrecipes. Guerreri, Matthew. "Fuzzy Math: The Hot Toddy (a history)" Wonderlandkitchen.com. Jan 30, 2012. Therlot, Lars. 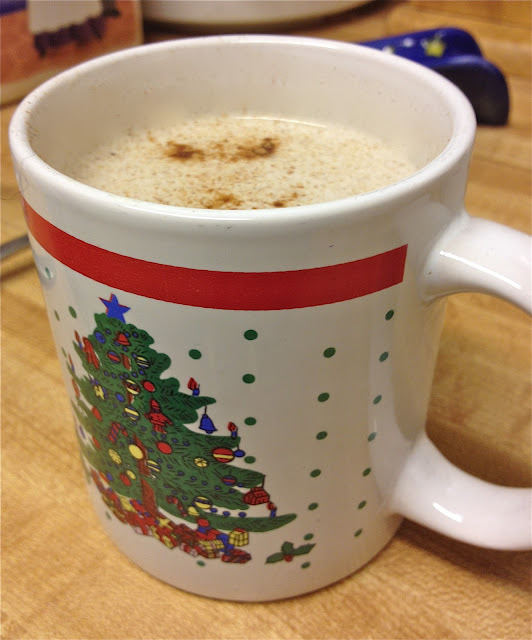 "Hot Buttered Rum." 12bottlebar.com. Dec 10, 2010. Hesser, Amanda. The New York Times Cookbook. I am all for doing a million reps of something, but not with light weights and not with uber long rest breaks. Unless you are injured, pregnant or elderly please don’t skimp on your workload. Also resting forever between doing a set of one exercise to the next is not beneficial to you, it allows your Heart Rate to drop amongst many other things (a post about this will come later). That being said today we are going to look at supersets (combining two or more exercises back to back) and on a way to incorporate this using your own body weight. For our purposes today we’re going to look at linking three exercises together with zero rest between movements completing 3-5 sets back to back (your aim is to do it in as little time as you are able). This superset will be repeated 3-5 times depending on your capabilities and current health status. Linking these exercises will also get your heart rate up and constitute as metabolic conditioning (metcon). Now on to the Metcon for the day! If any of these exercises are too much for you, please know there are modifications. You could pause and touch the floor with your whole body during the burpee. You could jog instead of run or walk and jog instead of just jog. There are so many options that will make each movement possible for you wherever you are at in your fitness journey. 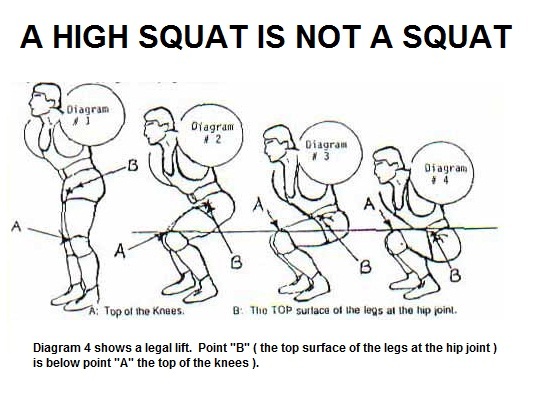 Slow things down if you must to ensure you always have proper form so as to prevent injury. Disclaimer: Before starting this workout please consult your doctor to confirm you are okay to start an exercise program. I love tomatoes. I generally eat seasonally, but I love tomatoes all year round, even when they aren’t in season. Someday, I want to be the type of person who buys tons of tomatoes from the farmers market in the summer, processes and cans them, and has local tomatoes to use all year round. I wrote that, and then realized that I am the type of person who would do that, I just haven’t gotten around to including it in my summer routine yet. Water berries, about to be magically transformed. A decent solution to this problem is to roast them. It concentrates the tomato flavor just enough, leaving you with yummy cooked tomatoes ready to use in recipes. I like the roasted tomatoes better than canned because they lack the metallic aftertaste of canned tomatoes. Am I the only person who notices that? It cooks away after a bit in soups and sauces, but I’m fairly certain it isn’t a figment of my imagination. This recipe is really a building block for other meals. 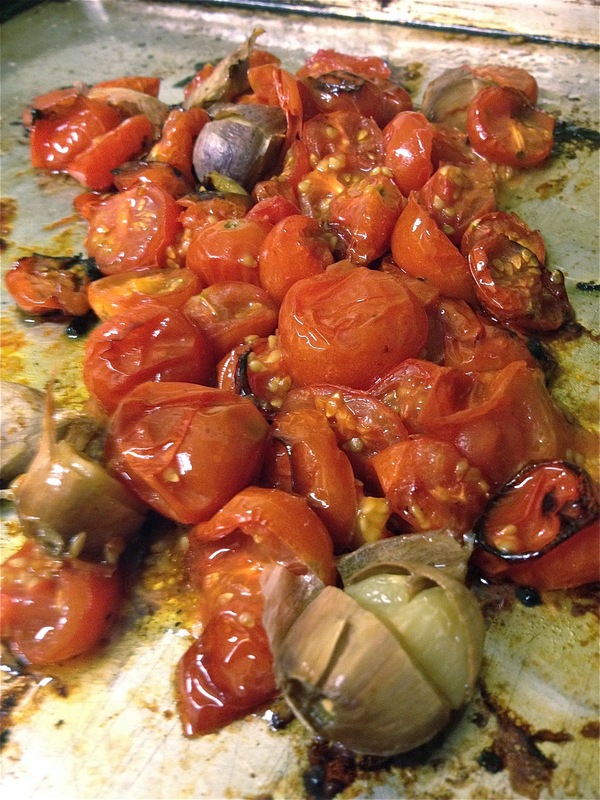 I combined these tomatoes with olives and capers and served them on pan fried chicken. Additionally, they would be great on toasted bread, on sandwiches, or mixed with pasta or vegetables. Use them anywhere you would use raw tomatoes in summertime. Enjoy! 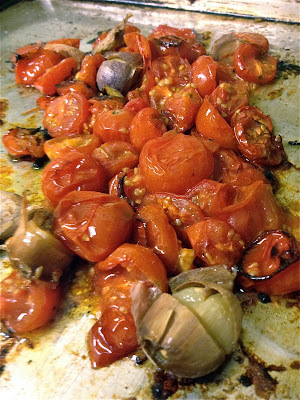 Toss tomatoes and garlic with enough olive oil so that they shine, and a big pinch of salt. 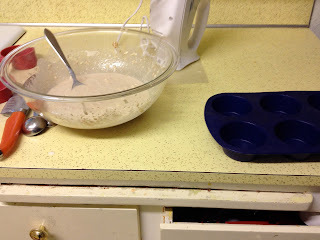 Spread out mixture on baking sheet or shallow baking dish. Bake for 30-45 minutes, or until tomatoes are very soft. Cool slightly and remove garlic from peels. 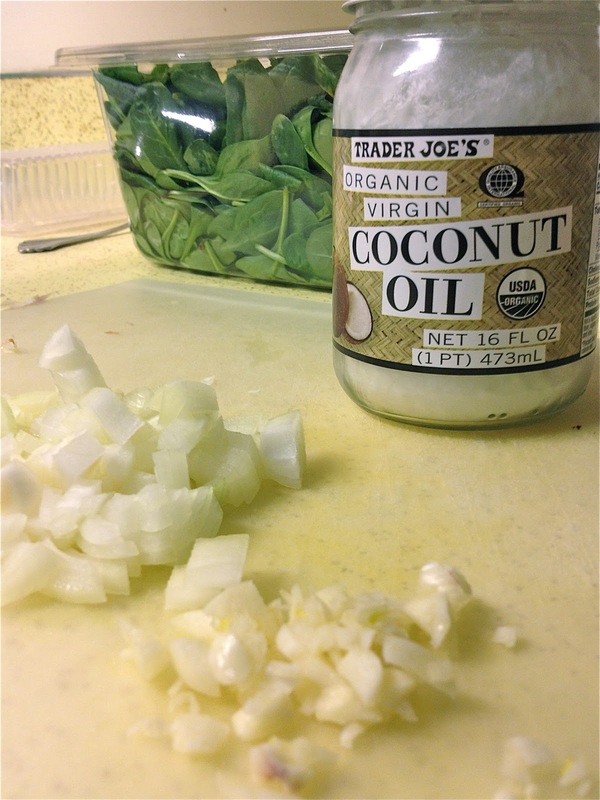 Use immediately or store in the fridge in a jar, covered with additional olive oil. 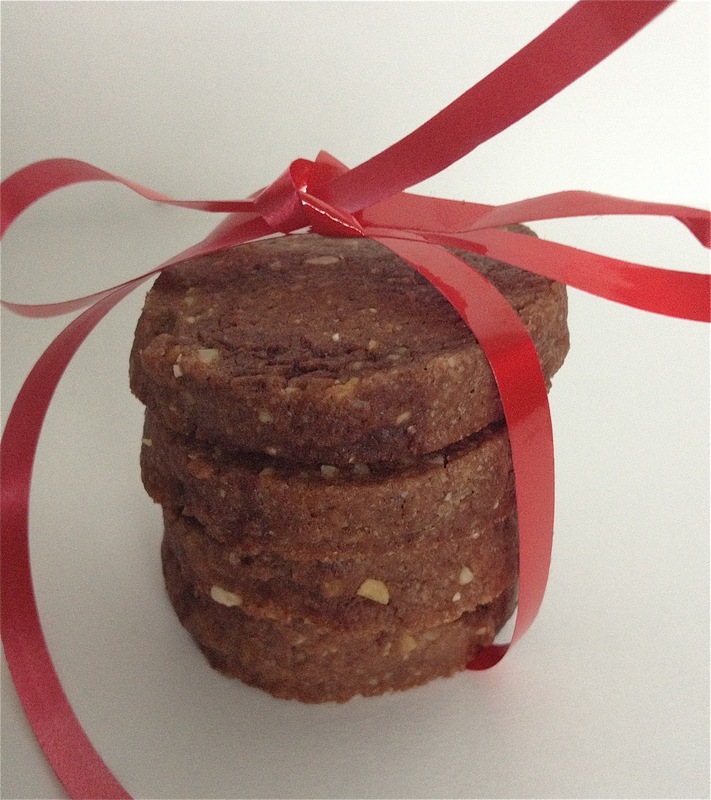 Since medieval times, cookies have been a Christmas tradition. Far from being an everyday food, cookies were a special part of festival seasons. During the industrial revolution, cookies became less about eating a sweet treat and more about decorating. Manufactured cookie cutters, molds and decorating tools became available to everyone. Today, when I think Christmas Cookies, I think of sugar cookies cut in many marvelous shapes, topped with bright icing. My family always made those. If your family has other traditions, I’d love to hear about them. Personally, I don’t like frosted sugar cookies at all. I think they have no flavor other than cloying sweetness. I hate how the frosting gets hard as a rock after a day or so. Judging by how they seem to stick around, I don’t think I’m alone. I love decorating them, but when they’re done, I pawn them off on other people. This year, I said no more. This year, I made some cookies that I actually want to eat. I made Chocolate Spice Quickies, from Baking: From My Home to Yours by Dorie Greenspan. They are simple slice and bake cookies, made with cocoa and ground almonds, flavored with zippy allspice and a swirl of melted chocolate. My humble cookies, small but mighty. They might not win any beauty contests, but they are a crumbly, buttery delight. They’re a manageable size so I don’t have to feel guilty for having just one. They won’t linger around until Christmas. They’ll be gone and I can make more cookies! Someday, I’ll make a sugar cookie recipe that feels the same way. With icing that doesn’t taste like a sweet fossil. Someday. I encourage everyone to dress up their favorite cookies for Christmas. There’s no reason that we have to stick to the sugar cookie cutout formula. Its a Christmas revolution! And if you absolutely love sugar cookies, I’d be glad to give you some! Maybe we can make a registry of sugar cookie donors and receivers. There is no one way to make borscht. The Ukrainian version of beets cooked in meat broth is what many people associate with borscht. However, recipes have been passed down through families from generation to generation, with everyone changing it to suit their tastes and resources. Some add other veggies and extra meat. Some serve it with sour cream. Or yogurt. Or radishes. Or mushrooms. 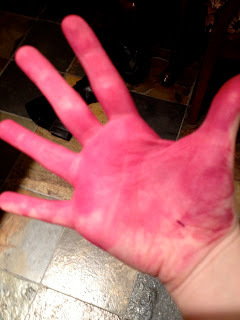 They add tomatoes, or replace the beets altogether. The possibilities are endless, and I’m sure everyone thinks their version is the best. That's the beautiful thing about traditional food. 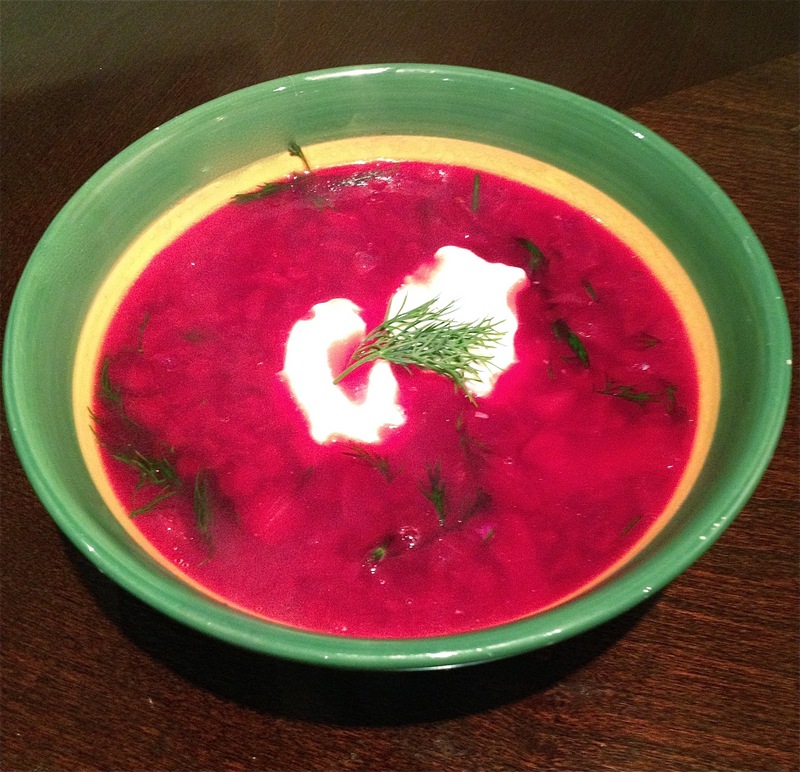 The only rule: borscht is red. I chose this recipe for several reasons. First, it was cheap. There aren’t any whacky cuts of meat or a long list of ingredients. Second, it was fast. On this particular day, I didn’t want to simmer a cow leg all afternoon. In fact, since I cooked it for Sarah, I didn’t want to use any cow parts at all. She doesn’t eat cows. Last but certainly not least, it is light and healthy. 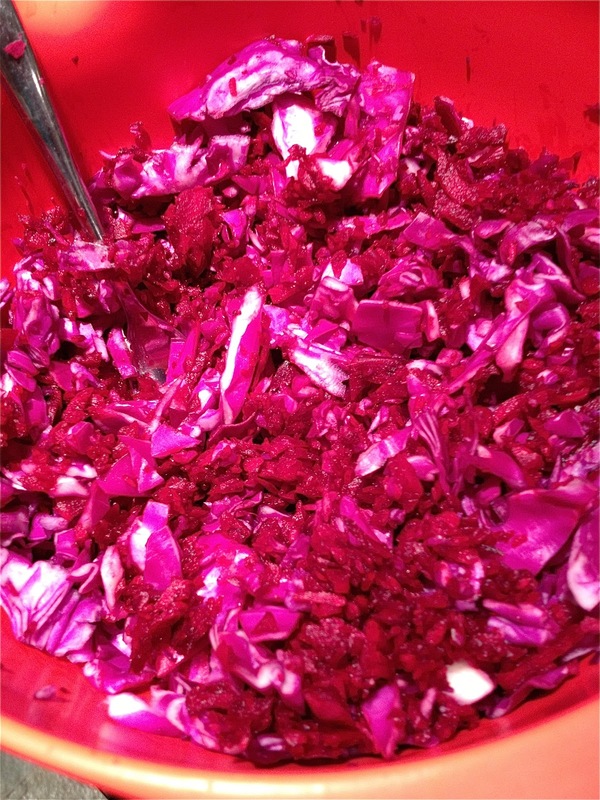 Beets and cabbage are full of nutrients! Can nutrients be absorbed through skin? If so, I'm set. The results were fantastic, and I think borscht will replace simple roast beets as go-to dish for any beets I get in my CSA box next year. Bonus tip: Beet juice can be removed from hands, baby faces, and other surfaces with an acid (like vinegar or lemon juice) plus salt. George is 1/16 Russian and he approved. Melt the butter in a soup pot over medium heat. Add the onion and saute until soft. Add the garlic and cook for one minute. 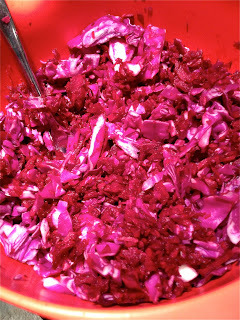 Add the cabbage and beets, turn up the heat to medium high, and cook for about 10 minutes, stirring occasionally. Add the broth and 1 teaspoon salt, bring to a boil and simmer, uncovered, for 30 minutes. Add the dill, vinegar, and remaining salt. Taste, and add more vinegar if the soup is too sweet. Meek, James. “The story of borshch.” The Guardian, 14 March 2008. That’s my husband’s favorite quote to taunt me with because he thinks it’s funny how I nerd out about eating Paleo. What’s Paleo you may ask? It is eating lean meats, eggs, vegetables, fruits, nuts and seeds, healthy oils and nothing more. Why did I start eating this way you might also be wondering? Well changing my diet and lifestyle came about because of serious health problems I started developing a few years ago. When some kids are little they love fries, corn dogs, and fried chicken. I was one of these kids, but my stomach and bowels didn’t seem to be able to take on the ‘fried’ food. Consuming anything that was battered and fried generally constituted that I would have a bout of a stomach ache or be in the bathroom in mild pain for hours. A family history of IBS and GI issues preceded me, so everyone wrote symptoms off to the fact that I should just avoid fried foods because that’s what probably was causing issues. Then came the sensitivity to richer dairy products like butter, cream cheese, cheese and ice cream. I would eat and eat and eat, knowing full well that my stomach was going to cramp, my plumbing would surely become backed up and I’d get the biggest wave of ‘brain fuzz’ sweeping over me momentarily. Again there was a family history of lactose intolerance. Over this past spring and summer I began training at Crossfit (a gym) and discovered they were promoting the ‘Paleo Diet.’ The coaches said to try it for 30 days and see if I noticed a difference in training and other areas of my health. Wowee! Let me tell you! That 30 days in July had me feeling the best I’d felt since I could remember. My skin cleared up, no more IBS-like symptoms, no more GI problems, regular bowel movements, weight loss (and in my stomach no less! ), energy that could rival five red bulls, no cravings for bread and cheese (two of my weaknesses). Once the 30 days were up I went on a bender of having candies, cakes, bread, pizza, pasta and anything else non-Paleo I could lay my hands on. Cue IBS, GI issues, dizziness, nausea and a multitude of other unpleasant side effects. Normal souls may find this a time to reassess treating my stomach like a garbage pit, but it turns out there is a thing called gluten intolerance (also linked to gluten addiction) and lack of will power that seemed to be a major roadblock. I saw my doctor within the past two months and confirmed with her all the symptoms I was experiencing which mirrored (aside from vomiting) all of the symptoms for gluten intolerance. She recommended I infuse my diet with gluten (equivalent of 4-6 slices of bread a day) to determine if that was what caused so many of my issues, and boy, was that the worst experience ever. Thanksgiving was a real drag with all of the gluten filled foods and major weight gain. Starting this past Sunday 12/2/12 I committed to myself to go paleo for good since I had completed the allotted time recommended for a gluten rich diet. Thank goodness for eating paleo! Within this past week I have lost 11 pounds, my IBS/GI problems are fixed and my skin is clearing up. Makes me feel like the sun is shining and it’s shining on me. So read through what I’ve linked and if it sounds like something you’ve been experiencing don’t hesitate to ask your doctor about whether you may have a gluten or dairy intolerance. Hi I am Katie, and here’s me in a nutshell. I love to eat, and used to live to eat. Now I eat to live. There is never a day that goes by that I am not reading a new scientific article about gluten intolerance and fitness or perusing a blog on gourmet paleo cooking ideas. I Crossfit and am on the Couch to 5k running series. Hit me up with your nutritional, health and fitness based questions. 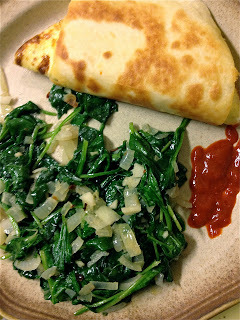 "Eat Your Veggies" is a pseudo-weekly series featuring easy, seasonal veggie recipes. I guess I’ve been going a little squash crazy lately, only because I have a ton of it leftover from my CSA. And its just such a quintessential fall food: brilliantly orange, soft, warm, and pillowy. 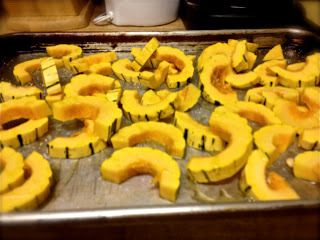 Delicata Squash are awesome. They’re small, so you can buy only the amount you need and not have awkward half-squashes wrapped in plastic and tupperware bins of puree hanging around your kitchen. Peeling winter squash is the most dangerous and time consuming aspect of preparation, but Delicata skin is thin enough to digest, so no peeling required! Hooray for not going to the ER with severed fingers! Give roasting them a shot. Its quick and easy, and makes a great side dish to any fall or winter meal. I served it with mini meat loaves and green salad. 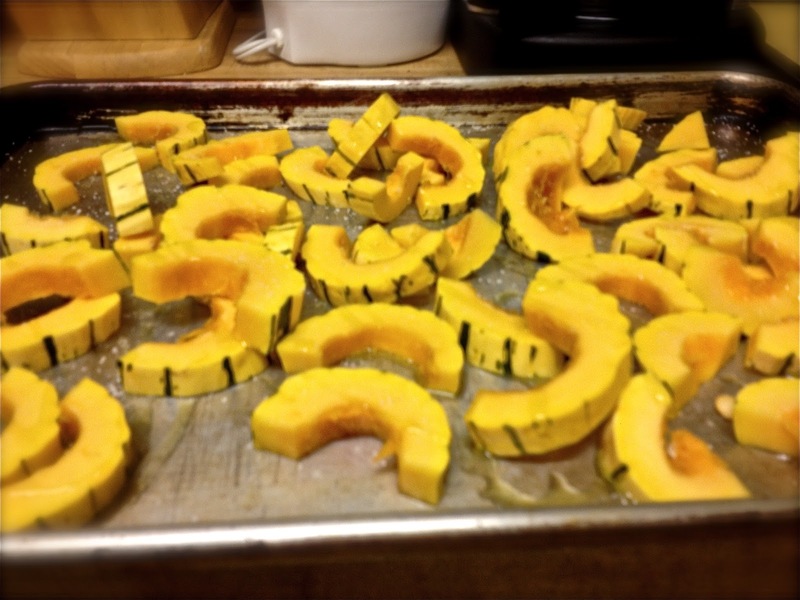 Cut the squash in half lengthwise and scoop out the seeds and pulp with a spoon. Slice crosswise into half inch crescents. Toss with olive oil, salt to taste, and rosemary. Place on a baking sheet and roast in 400F oven for 20-30 minutes, until very tender and easily pierced with a fork. Allow to cool for five minutes and place in a large bowl. Toss squash with mustard, vinegar, sugar, and parsley. Add salt to taste. 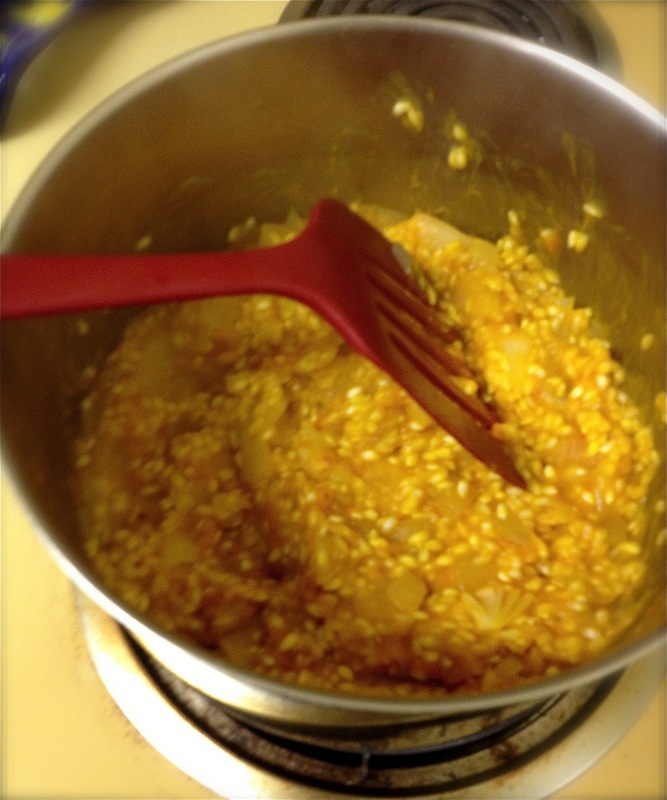 Recipe Source: Rachael’s brain, probably amalgamated from various squash recipes. 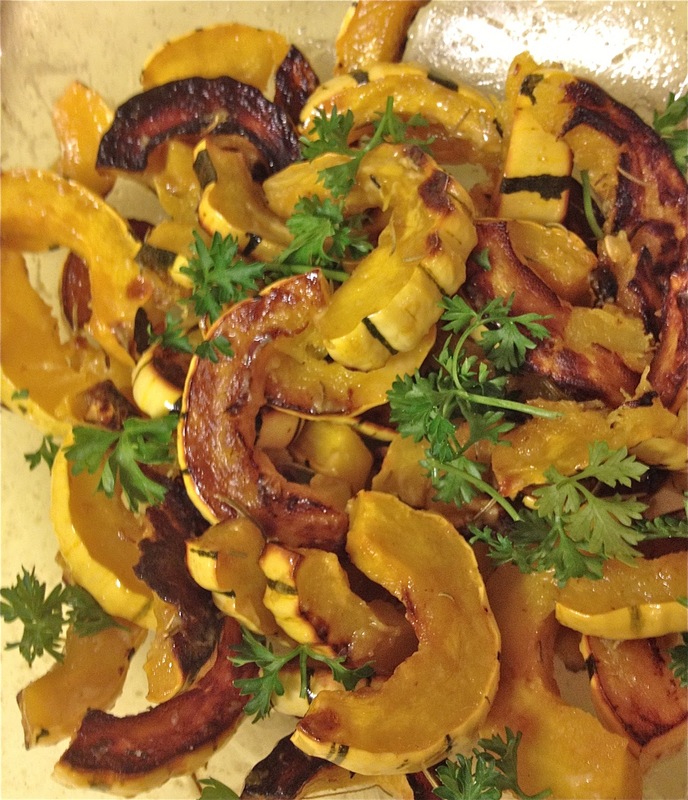 Delicata Squash Info Source (and more recipe ideas): “Healthy Delicata Squash Recipes.” EatingWell. I never seem to have the exact amount of squash puree that a recipe calls for. Sometimes I have too little to use in another recipe, yet too much to throw out. Usually it ends up in the trash anyway. Or ends up sitting in the fridge for weeks before ending up in the trash. But how do you use a tiny amount of squash puree? Why, throw it in a risotto of course! 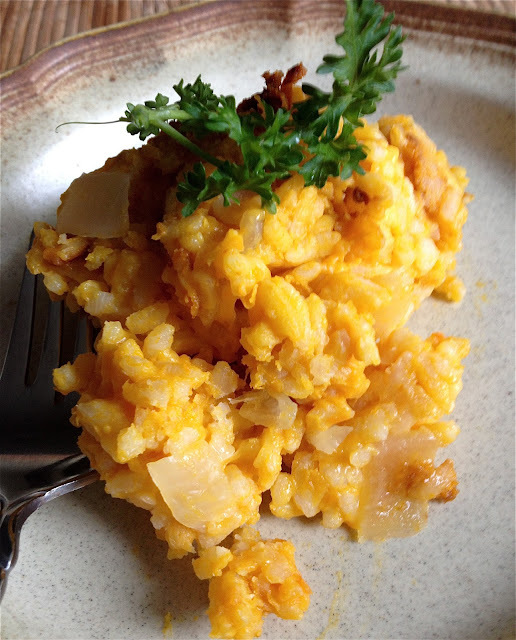 Disclaimer: risotto in general is not a health food, and this version is no exception. It is butter, starchy, and cheesy. “Carb-tastic,” if you will. I try to limit my portion size. The beauty of this recipe is that you can vary the amount of squash that you use, depending on how much you have and how much squashy flavor you like. A little bit of squash just adds a layer of depth to the primary cheese flavor. Adding more will feature the squash flavor more prominently. 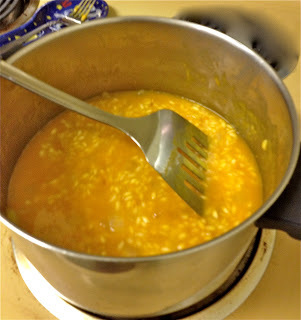 Even the smallest amount will turn the risotto a brilliant orange, making it look similar to Kraft Macaroni and Cheese. That resemblance alone made the picky eaters in my life much more open to trying it! I served this as a side dish to steaks. That was a mistake. Its so heavy and creamy, I think that it can be a meal on its own, when accompanied by an interesting salad. Melt 2 tablespoons butter in a large saucepan over medium heat. Add onion and cook until translucent. Add rice and toss well to coat with butter. Stir and cook until translucent, but be careful not to allow the rice to brown. Add the wine. Cook until the wine is almost entirely absorbed. Add the squash puree and 1 cup of broth. Simmer, stirring occasionally until the liquid is almost entirely absorbed, then add another ½ cup broth. When the rice is tender, add 1 tablespoon butter and the parmesan cheese. Turn off the heat and stir the risotto vigorously. Season to taste with salt. Let stand for a few minutes before serving. Soup is a delicious way to use up a great deal of leftover turkey from Thanksgiving or another holiday feast. 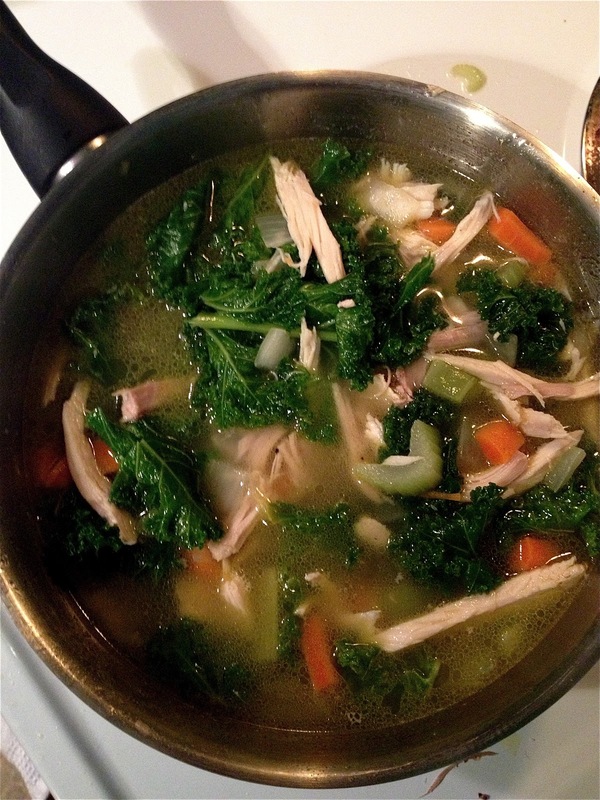 Turkey soup is healthy and light, which is a nice counterpoint to the rich meals of this time of year. I made broth by boiling the turkey carcass and some assorted vegetables. Apparently bones contain magical substances that combine with water to become pure deliciousness. Don’t throw away your turkey bones without unleashing their awesome power! Making broth takes a long time, but you don’t have to pay much attention to it. It just kind of does its thing. If you have time, I suggest cooling the broth in the fridge so you can scoop off the congealed fat that floats to the surface. Its a dirty job, but I’d rather have the fat in the garbage than in my arteries. For the rest of the soup, I sauteed some onions/celery/carrots, which also happened to be leftovers from Thanksgiving. Don’t use the veggies from the broth, they’ll be slimy and bland at this point. I added some turkey and cooked kale and voila! Soup! 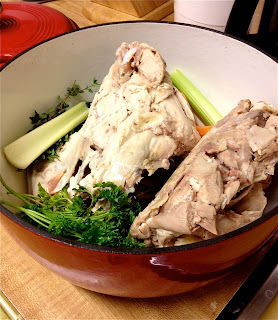 Place turkey carcass and all other broth ingredients in a large pot. Cover (or mostly cover) with water (about 4 quarts). Simmer for two hours. If you have time, cool and skim off fat. 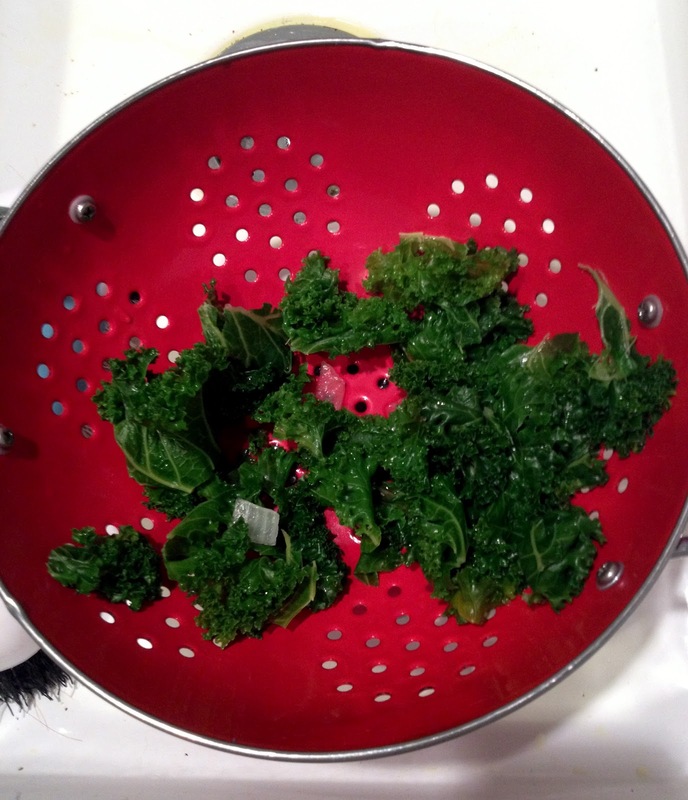 Bring a pot of water to boiling, and add the kale. Cook for 3-5 minutes until bright green and tender. Drain, rinse with cool water and chop. Saute onions, celery, and carrots in olive oil until soft. Add broth, turkey and kale. Simmer until heated through, about 5 minutes. "Tomorrow, I'm going to get into the Christmas spirit...my own way." Thanksgiving has passed. I don’t know about the rest of you, but I’m not ready to jump into the Christmas spirit with both feet. So I made a bizarre little playlist to ease into the holiday. Whether you’re sick of traditional Christmas music and want a change, or just love love love all things Christmas, these are fun, interesting songs, and I think you’ll enjoy them. This is the kind of playlist you listen to with headphones while you wait for the bus. I tend to feel that way about most playlists. In any case, after preparing and listening to my Unconventional Christmas Playlist, I suddenly crave snow. I think that’s a sign of success! 10. Deer Tick- Holy S%!t, It’s Christmas! It’s Christmas So We’ll Stop and Rudy have exceptionally beautiful (and sad) lyrics. "Tomorrow, I'm going to eat more vegetables." This recipe was invented as the result of my attempts to create a seasonally appropriate Taco Salad recipe, one that did not rely on fresh lettuce and tomatoes as its backbone. 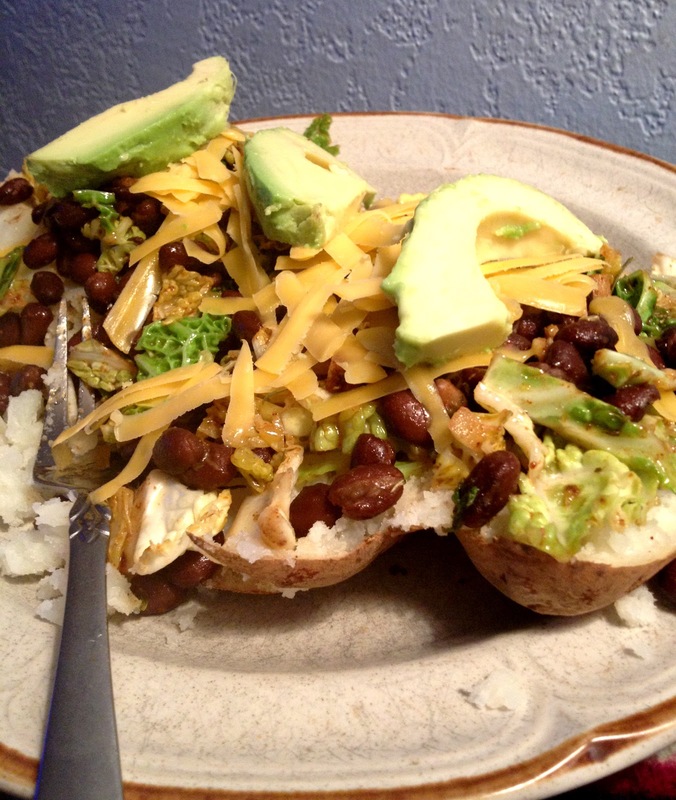 I ended up morphing it into a vaguely southwestern type of baked potato. Instead of lettuce, I used crunchy cabbage mixed with beans, seasoned with a paprika olive oil dressing. I’ll admit that back in the day, I dismissed cabbage. Before I started cooking with it I thought of it as bland and uninteresting. Yet when cooked properly (as in not boiled into stringy oblivion) its actually really sweet and plays well with many genres of food. I thought it was a good choice for the somewhat mexican flavors in this dish. Make dressing: gently heat olive oil over medium low heat until warm. Add all other ingredients and let the flavors blend while you prepare the rest of the dish. 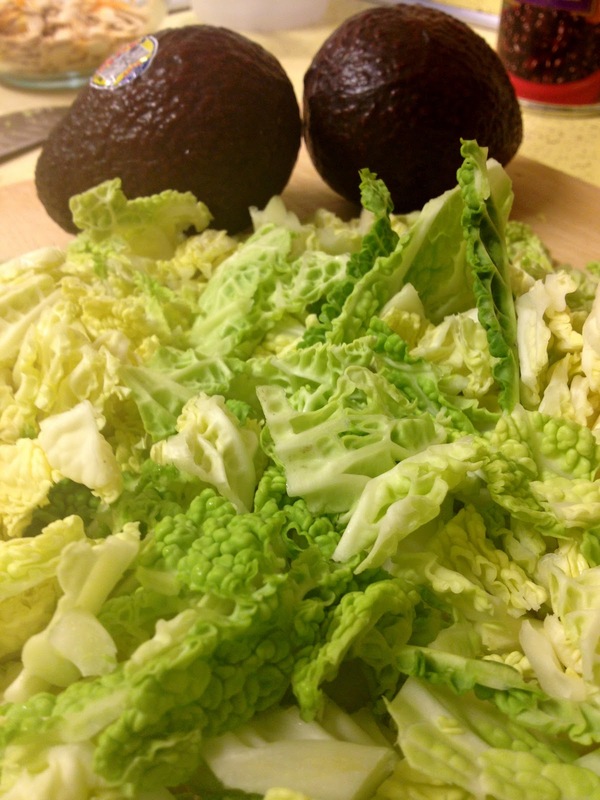 Saute cabbage in a few tablespoons olive oil over medium heat until just tender. Add dressing and black beans. Cook until heated through. Cut open baked potato and top with cabbage/bean mixture. Garnish with cheese and avocado.